There’s no doubt about it, folks – whether or not we are ready, the holidays are upon us. And though my knitting is still with me, I’m allowing the cookie-baking, gift-wrapping, and other miscellaneous trappings of the season to sneak in. This is all of the good. I’m checking out for a few days to do Christmas things, and wish you all the very best greetings of the season. Where ever you may be, dear blog readers, I hope you have some restful and enjoyable time this holiday, that you have some time to knit whatever you please, that refreshing beverages are not far, and that the holidays treat you well. 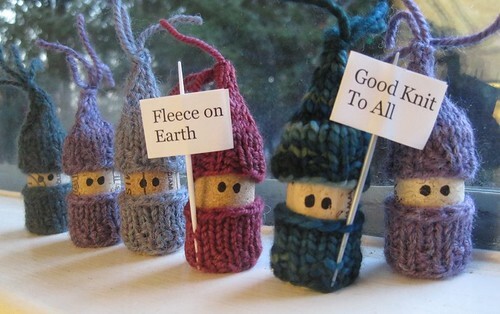 How about “Fleece on Earth, Good Wool to All”? Merry Christmas to you! Catch you on the other side of New Year’s! LOVE LOVE LOVE those crazy little winey gnomesters. The gnomesters are cute – but I want some of those cookies! Hope you enjoy your holidays too! And |I just love your little Korkinesse. They’re too cute (too bad my wine bottles have screw tops). Merry Christmas! Thanks for great blog posts and to all a good night. I love the the little snowmen corks. Bookmarked for next year! Are those…. NINJA THROWING STARS?!? That you’ve cleverly disguised as some sort of Christmas cookie?!? I think I need to get out of the kitchen…. Have an *awesome* Christmas, Glenna! The gnomesters are so adorable! Merry Christmas and happy knitting! 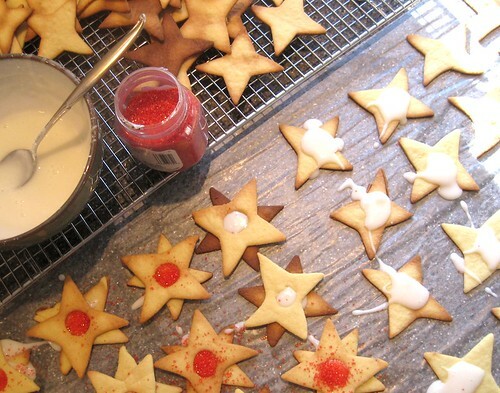 Love the korknisse….. thanks for reminding me about them. I’ve knitted about a dozen since you started showing them last week. I love your little protesters 😉 Merry Christmas to you and thanks for sharing your wonderful work on your blog!